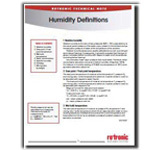 This easy-to-read 3 page technical note defines 7 essential humidity parameters that should be fully understood by anyone who measures humidity in a controlled environment. The first step in making a more reliable, repeatable and accurate measurement is to improve your understanding of the parameter. Download the technical note here.